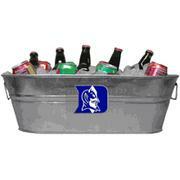 Happy New Beer's Eve, Blue Devil Nation! Two weeks of Football Friday in a row? For what do we deserve such fortune, you ask? I guess it just seemed like the right thing to do. Or maybe because it's New Beer's Eve, one of America's terrific obscure holidays. In all seriousness, though, thanks for reading and please spread the word that Blue Devil Nation is home of the best Duke Football coverage around. One - okay, three - important points to remember about last Saturday's scrimmage. 1. It's a spring game. The team is a work in progress; September 1st is still nearly five months away. 2. It's a spring game. Several starters did not play; players with injuries have plenty of time to heal. 3. It's a spring game. Duke played against Duke; who knows how they'll look against another opponent. All that being said, there was plenty to be excited about and a number of things to be concerned about based on Saturday's performances. If you haven't checked them out already, be sure to watch our video interviews with Coach Cutcliffe, Sean Renfree, Ross Cockrell, and David Reeves to get their thoughts on Duke's spring. Honestly, I don't think it was a fluke that the starting defense outplayed the starting offense. Even without Kelby Brown, August Campbell, Kenny Anunike, and Jordan DeWalt-Ondijo, the white team defense took it to the blue team offense. And it was a balanced effort. The secondary, crucial to Duke's 4-2-5 scheme, was particularly encouraging. Brandon Braxton looked comfortable at safety and led the way with 5 tackles, a number that was matched by his replacement, redshirt-freshman Chris Tavarez, who also forced and recovered a fumble late in the game. Jordon Byas and Walt Canty, two veterans at safety, also had strong efforts, each adding 3 tacklesincluding a tackle for a loss by Byas. Cornerbacks Ross Cockrell, Lee Butler, Anthony Young-Wiseman and Tony Foster held the blue team's top receivers, Blair Holliday and Jamison Crowder, without a touchdown and to just 4 total catches on the day. 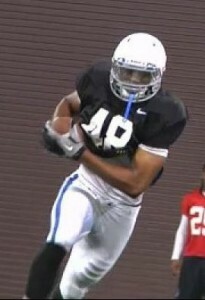 Of course, it was Cockrell's forced fumble on Josh Snead that was the play of the day and earned him defensive MVP honors. Kyler Brown and David Helton added strong performances from the linebacker position, and the Blue Devils will need them to continue to matuer ahead of schedule this fall. Duke was able to pressure the blue QBs from a number of positions, as DE Jamal Wallace registered a sack, while Braxton, Cockrell, and LB David Helton all were credited with a QB pressure. As with all things, it's far from perfect, but the overall defensive effort appeared to be a big step in the right direction heading to the fall. On the opposite side of the ball, there were plenty of flashes from individual players, but the blue team offense never seemed to be clicking on all cylinders - yet. Brandon Connette, the offensive MVP, certainly had a strong performance, highlighted by two powerful runs through the teeth of the defense to put the blue team on the scoreboard for the first time all afternoon, halfway through the 2nd quarter. Of note, he was also an efficient 4/7 through the air for 83 yards, including a 27-yard TD strike to Josh Snead. Speaking of Josh Snead, it was great to see him healthy and focused. His burst and speed was something that was lacking in Duke's running game a year ago. All indications are that with the return of Snead alongside last year's leading rusher Juwan Thompson and senior Desmond Scott, this should be Duke's strongest running game under Coach Cutcliffe. We certainly saw flashes from some other players, such as David Reeves and Will Monday, all of which were encouraging. Perhaps most encouraging, however, was a glimpse at the increased tempo and diverse schemes utilized by the blue offense. It's all still a work in progress, with much more to be added in terms of personnel and plays, but opposing defenses should have a lot to prepare for against this year's Duke offense. And finally, a look at the future. With the way the teams were divided, it was hard to take much of anything away from the matchup of the white offense against the blue defense, as both units were comprised primarily of walk-ons. Several walk-ons did have strong efforts, and it wouldn't be surprising to see guys like Chris Hoover, Brandon Watkins and Eric Adams eventually play a few snaps in limited situations. Their blue-collar efforts are to be commended, and it was great for them to receive recognition. The scholarship players on those units, however, provide a nice glimpse into the future of the Blue Devil program. Obviously, freshman Thomas Sirk is the most notable, and he played well on Saturday. But before we crown him the starting QB, remember that most of his snaps came against an inexperienced defense and he still only played one year of quarterback in high school. All that being said, Sirk has the tools to compete for snaps in 2013, and given the depth issues at wide receiver, it's too early to rule out lining him up out wide at some point this fall. Another strong performance was put in by redshirt-freshman WR Nick Hill, who has an excellent opportunity with the recent loss of senior WR Tyree Watkins. Defensively, Tim Burton, Britton Grier, and Sam Marshall all piled up tackles; they will push the starters on the depth chart for sure this fall, but realistically may be a year away from significantly contributing. Ok, let's get it out of the way. Sean Renfree had a forgettable spring game. He finished 10/23 for 104 yards with 2 interceptions. His first interception was a poor throw that shouldn't be made by a redshirt-senior QB; the second was slightly more forgivable, as the ball appeared to be tipped into the waiting arms of Kyler Brown. Most concerning, however, was the apparent lack of rhythm with the new offense, and the lack of chemistry with some of the younger wide receivers. Fortunately, Renfree is his own biggest critic, and one of the hardest workers on this team; fully expect for him to put in the work to be ready for a strong senior campaign. After a big spring, WR Blair Holliday didn't have the breakout performance many expected, and he and Jamison Crowder will have to emerge as consistent threats if Duke is to have any success moving the ball this fall. The other biggest concern of the day was the play along the line of scrimmage. Neither the offensive nor defensive line was able to control the game, and I think there's still a lot of work to be done along both units. The offensive line needs to get Brian Moore back at center, and the hope is that this group will be able to stay healthy and consistent this fall. They will have to be a stabilizing force for a potentially dynamic and at times unconventional offense. The defensive line remains the big weakness of this team, overall. Brandon Connette exposed the weakness up the middle on two big runs in the 2nd quarter. Hopefully, the return of Kenny Anunike and Jordan DeWalt-Ondijo, along with another year under Coach Petri, will allow this group to take a big step forward this fall. Come on, you didn't really think I was going to end on a down note, did you? I thought it might be more fun to discuss recruiting than to argue over whether or not to renew your season tickets, debate the temperature of the leather chair in Coach Cutcliffe's office, or complain about play-calling. Just my opinion. I'm sure you can find a place to discuss those things. As for recruiting, Duke locked up two more verbal commitments over the weekend, solidifying the defensive backfield in the class of 2013. Safety prospect Jake Kite is receiving rave reviews for a highlight video that has basically gone viral throughout the Duke Football fanbase. At 6'1," the junior from Roanoke packs a heavy punch, and Duke fans should be very excited to watch this young man bring down opponents in Wallace Wade Stadium. About a month ago, BDN spoke with a little-known sleeper prospect from Nash County in Dequavais Mann. At 5'9" and playing multiple positions for a Northern Nash team that finished 2-8 last year, Mann's recruitment got off to a slow start. That changed quickly when the junior athlete posted a 4.42 second 40-yard dash at a recent combine, and showcased his abilities as a lockdown defender. 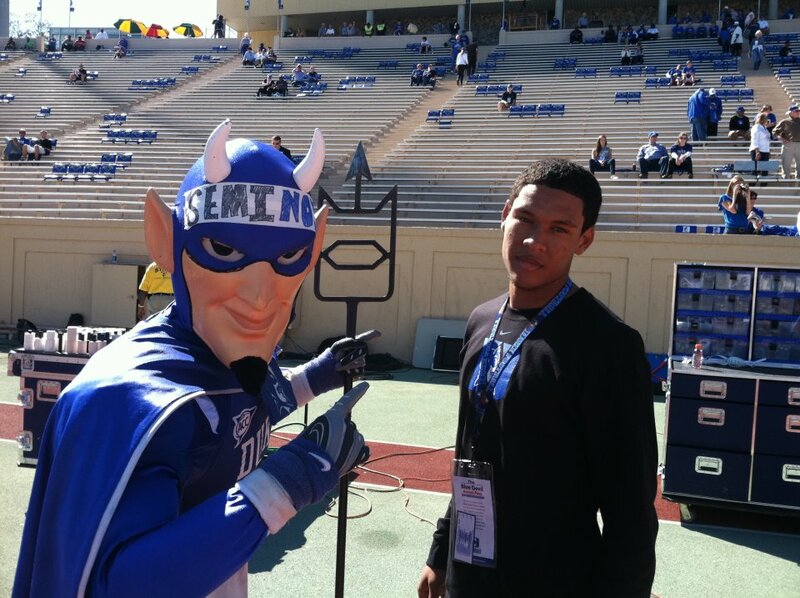 Mann started lining up visits, starting with a return trip to Durham for the Duke Spring Game. The Blue Devils extended a scholarship and it took just two days for Mann to offer his commitment to Coach Cutcliffe. And the staff is keeping the pedal to the metal, hosting top Pennsylvania QB Chavas Rawlins on an unofficial visit in Durham yesterday. Don't expect things to slow down anytime soon; we're just getting started. The spring evaluation period kicks off on April 14th and lasts through the end of May, nicely coinciding with most high school spring football schedules. With their own spring practice behind them, the Duke staff will be out in full force, evaluating dozens of prospects and checking up on others. We'll then reach the height of the recruting season in June, as Duke hosts their annual football camps, an opportunity for serious evaluation for both the prospects and coaches. So in other words, if you want to keep up with the latest in Duke Football, now would be an excellent time to try out a BDN Premium Membership. Ok, that's my pitch for the day. I know, these columns get wordier and wordier. Though in person I'm known for brevity, my writing clearly is not. Check back next week for another helping of Football Friday, provided I am able to purchase a new ribbon for my typewriter. In the meantime, enjoy the Masters for you golf fans, Happy Easter to the Christians, and regardless of your interests or beliefs, I hope you all enjoy National Beer Day on Saturday. WE ARE DUKE. Are you ready for some football, Blue Devil Nation? Saturday afternoon will be your last chance until September 1st to see some Duke Football, so get your fill. 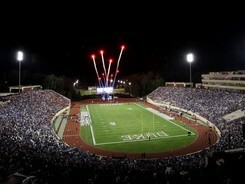 The Blue Devils will take to the field on Saturday at 1PM in Wallace Wade Stadium for their annual spring game. BDN's Football Friday is here for your preview. First of all, highs in the upper 70s, with a slight chance of isolated thunderstorms. Should be a perfect spring day for some football if the rains miss the Methodist Flats. That also means a perfect day for some tailgating. Get there early, as the team will conduct the Blue Devil Walk at 11:00 AM. Team BDN will be there in full force, so be sure to say hi. Here's the information on the parking situation. Bring your wallets, even though admission is free (stadium gates open at 11:15), as there will be plenty of opportunities to get your Blue Devil gear, as well as stuff your face with Chick-fil-a, Domino's, and Blue Devil Concessions. Oh, and the most important reason to bring your wallet is to purchase your 2012 season tickets. Ticket office reps will be on hand and help you pick your exact seats. Try before you buy. 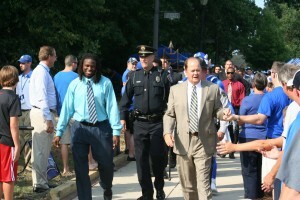 The game kicks off at 1PM and Coach Cutcliffe will address the crowd during halftime of the scrimmage. Spring practice awards will also be announced at halftime. The Duke offense will feature a number of familiar faces, but it's likely to be the unfamiliar ones who will make an impression on Saturday. We all know what Conner Vernon is capable of at wide receiver, but as he's been limited due to injury this spring, expect to see a lot of Blair Holliday and Jamison Crowder, both of whom have had very strong spring performances. Nick Hill is another young face who appears ready to contribute, and Corey Gattis and Tyree Watkins add a veteran presence to the receiving corps. With Jack Farrell and Braxton Deaver sidelined with injuries, the Blue Devils had concerns at wide receiver heading into spring practice. Coming out of spring practice, tight end is no longer a concern, and you'll likely see why as Issac Blakeney and David Reeves are sure to impress. Up front, the Duke offensive line returns all but graduating senior Kyle Hill, and that continuity should benefit the Blue Devil offense. This group has improved each year under Coach Cutcliffe, and they're looking to take a big step forward this fall under new OL Coach John Latina. Expect to see a few holes opened for the likes of the now healthy Josh Snead and last year's leading rusher Juwan Thompson, who have seen the majority of carries with senior Desmond Scott nursing injury. If that trio isn't impressive enough for you, the Blue Devils will add two more big-time running backs in just a few months, as Jela Duncan and Shaquille Powell will push for early playing time. Am I forgetting something? Ah, yes, quarterback. While Peyton Manning had been a fixture in the Duke practice facilities this offseason, he will not be taking snaps under center for the Blue Devils on Saturday. Sean Renfree remains entrenched as the starter, and he's had yet another good spring running the Duke offense. While much of spring practice is situational, Renfree has shown the ability to get the ball downfield, averaging 15.7 yards per completion in the last scrimmage. But Renfree's old news, right? Coach Cutcliffe and the Duke staff have been looking at ways to get guys like Brandon Connette and Anthony Boone more involved in the offense, and they've done well with running the ball and catching the ball in some unique schemes. But don't get too excited. Knowing the Duke coaching staff, the Blue Devils are unlikely to show off anything particularly new or exciting on Saturday, so we'll all just have to wait until the fall. Expect to see Connette, Boone, and freshman Thomas Sirk take several snaps under center in relief of Renfree; all have taken big steps forward in their command of the offense this spring. Somehow, it seems that Duke has had a perpetually young defense the past few years, and that remain the case this spring, though they are overall more experienced. The losses of Matt Daniels and Charlie Hatcher will be the biggest voids to fill, and there are a number of candidates looking to contribute. Up front, Duke will be without their top pass-rushers Saturday in Kenny Anunike and Jordan DeWalt-Ondijo, but will feature much of the same group of athletic ends we saw a year ago, led by Justin Foxx, Dezmond Johnson, and Jamal Wallace. Sydney Sarmiento, Jamal Bruce, and Nick Sink are likely to see the majority of time on the inside up front. The defensive line continues to improve under Coach Petri and has the benefit of going up against a big and experienced offensive line in practice. At linebacker, the Blue Devils will be without Kelby Brown for the foreseeable future, but expect sophomore David Helton to continue to impress. The redshirt is off for Kelby's younger, but bigger, brother Kyler, and it appears that a nose for the football is in their genes. Austin Gamble is the lone upperclassman, though sophomores C.J. France and Jon Woodruff have some experience. And before you get down on the Blue Devil linebackers, keep in mind that stud recruits Keilin Rayner and Deion Williams will be on campus in just a few months. Coach Knowles' 4-2-5 scheme relies heavily on the secondary, and the emergence of Ross Cockrell as a shutdown corner is key. He'll be joined by senior Lee Butler at cornerback, though youngsters Jared Boyd and Tim Burton will see time. The leader of the secondary this year is most likely to be leading returning tackler Walt Canty, though hard-hitting Jordon Byas has also turned some heads with August Campbell sidelined this spring. Newcomers to look for at safety include the hard-working Chris Tavarez, Britton Grier, transfer Jeremy Cash, and former WR Brandon Braxton. All should see snaps on Saturday and overall, this group has some of the best playmakers on the defensive side. Will Monday. That's about all you need to know. With Will Snyderwine and Alex King now graduated, Monday has handled all of the punting and kicking duties this spring, and handled them well. By the fall, incoming freshman Ross Martin may challenge him for the placekicking duties, but expect to see Monday handle the punting for the next four years in Durham. On the return side, Jamison Crowder remains the Blue Devils' top threat, but he'll be joined by incoming freshman DeVon Edwards this fall, who took more than a few kicks to the house during his high school career. In all likelihood, getting to see Monday punt and kick should be a refreshing sight for Blue Devil fans and the only real highlight on special teams Saturday. Who are all those people with lanyards and nametags? That would be the dozens of high school prospects and their families who will be on campus this weekend to take in the Blue Devil program. Several members of the Duke class of 2012 will be on hand Saturday, and they'll be joined by a huge group of future prospects. With 3 commitments already on board in 2013, the coaching staff is flying high on the trail and will have in some of their top targets in this class, including a handful considered among the nation's elite. Coach Cutcliffe and his staff work on recruiting every single day, and this weekend will be no exception. And just like the staff, we follow the recruiting trail here at BDN, so be sure to check out some of our recent interviews with the likes of TE Nathan Marcus, and OL Sterling Korona, and of course lots more to come. Don't be surprised if the Blue Devils hear more good news by the end of this weekend. In case you haven't figured it out already, Blue Devil Nation is the place to be for Duke Football fans. We cover the team year-round, and would love to have you join our growing BDN Premium community. We can't wait to see you all in Wallace Wade Stadium this Saturday. WE ARE DUKE. 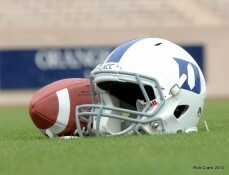 The 2011 Duke Football season is behind us. It's time to look forward to the future, and that begins with the class of 2012. Duke has already secured 15 verbal commitments in this class, and BDN will profile each of the newest Blue Devils as we head toward Signing Day 2012. Senior season recap: We finished 8-3 and made it to second round of playoffs. I thought that we had enough talent to win the championship, but I'm proud that we fought hard. I was voted to 2 All Star games. My coaches stressed State Championship and team first so I never really tracked stats. I played CB, Safety, RB, WR, and Punter. Commitment to Duke: I chose Duke for the opportunity to get a great education, play in the ACC against the great competition, the family atmosphere, and a defense that I'm excited to be a part of. Pro or College Role Models: I’ve heard comparisons to Laron Landry and Antonio Cromartie. College goals: Obtain my degree, help the team win championships, avoid serious injuries, and leave as a better player and person. Planned enrollment: No set date yet. I'll coordinate with admissions and the coaches. Message to Duke fans: I can't wait to get on campus. I look forward to spending my next 4 years at Duke and being a part of the community. Go Duke! BDN Scouting Report: Westray will join fellow Westlake alum Jon Woodruff in Durham next year, and both will be looking to make an impact on the defensive side of the ball. A high-end athlete, Westray played all three phases for Westlake, but will likely find a home at safety in Durham. He has an excellent nose for the ball and showed good instincts against the run. He will need to improve his footwork and coverage skills, but possesses good lateral agility and quickness. As a fundamentally-sound tackler and disciplined defender, Westray has the potential to develop into an excellent safety in Jim Knowles' defense. Head Coach David Cutcliffe and the Blue Devils had a productive weekend, hosting 13 prospects on official visits and securing three verbal commitments. The commitments bring Duke's class of 2012 to a total of 18 verbal commitments and help to solidify key areas of need for the program. Here's a quick look at the newest Blue Devils. Check back in to BDN for the latest from the players themselves. Welcome to Duke! RB Shaquille Powell committed to Duke over the weekend. BDN Scouting Report: Powell is an excellent between the tackles runner and brings an added dimension to the Duke backfield. 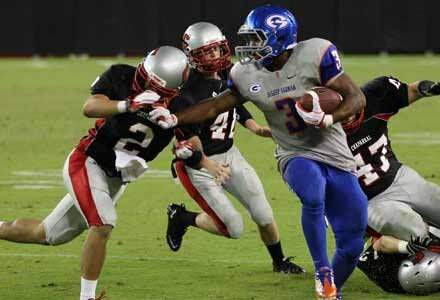 He does not have elite speed, but is elusive and was a workhorse in high school for Bishop Gorman. He should be an excellent short-yardage and goal-line threat from day one. He will need to continue to improve his ability to catch the ball out of the backfield and block to become an every down back at the college level. Overall, however, Duke fans should be excited about this pick-up. The coaching staff worked hard to land an elite back in this class and Powell is a great fit. 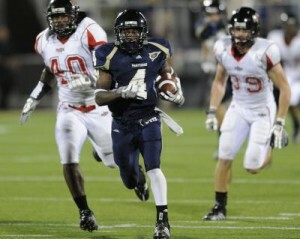 The addition of a blazer like Jela Duncan could be the perfect complement to finish off the Blue Devil class of 2012. BDN Scouting Report: Jackson is an under the radar lineman who impressed the staff at camp this summer. He will have to add some size and strength to play DT at the next level, but has the instincts and technique to be a solid ACC lineman in Durham. He's shown flashes of ability as a run-stopper and was an elite pass-rusher in high school, earning 1st Team All-State honors. An intelligent player, he should be a quick study at the college level. Overall, Jackson is another player who fits the athletic mold Duke has been recruiting on the defensive line over the past few classes. Under Rick Petri's tutelage, this group should continue to outperform expectations. BDN Scouting Report: McCarthy joins several other lightly-recruited Californians in Durham. The hard-hitting safety has had aspirations of playing ACC football and the Blue Devils were the first to offer him that opportunity. McCarthy will have work to do to become an ACC caliber defender, primarily in the weight room where he needs to get stronger and faster. 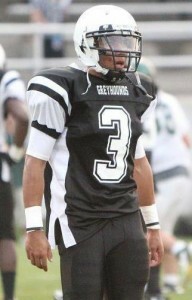 He's another intelligent football player with good instincts, and that should help him adjust to the college game. Coach Cutcliffe has focused on bringing in better athletes to Durham, and though undersized, McCarthy fits that bill. Coach Knowles has developed a group of outstanding safeties in Durham, and McCarthy has the tools to continue that tradition. Senior season recap: It was a dissapointing season for the team, losing many close games, and ending up 1-6 (1 game cancelled due to snow storm.) However, I personally think I had a great season and did the best I could to help the team win 100% of the time. Commitment to Duke: I get to play ACC football and get a fantastic education. Also, the coaches all seemed very wise and competitive. On my unofficial visit over the summer, it seemed like everyone was part of one big family, and everyone was close. Another bonus is the weather (compared to NY). In my eyes, it seemed like the perfect school to play football at. I committed on site during my visit for those reasons. Pro or College Role Models: I don't compare myself to, but strive to be like DeMarcus Ware and Clay Matthews. No one can block them. College goals: Win an ACC Championship and be 1st Team All-ACC. Message to Duke fans: I am also a State Champion Track & Field Athlete, and am trying to be an All-American this year. BDN Scouting Report: Wolf is clearly one of the most intriguing sleeper prospects in Duke's class of 2012. He's a tremendous athlete and comes from an extremely gifted family. A.J. has a good frame and will be able to add strength in a college weight program. In high school, he played all over the field for Hackley, a testament to his athleticism at 6'4" and 245 pounds. He was recruited to play defensive end at Duke, though has the skill set to potentially slide inside to defensive tackle. Wolf didn't see a very high level of competition in high school, so it remains to be seen how he will fare against college competition. Being able to focus on one position will allow him to perfect his techniques, but he already possesses good instincts and tackling ability. In all likelihood, A.J. will benefit from a redshirt year under Coach Petri in Durham, but his athleticism and intelligence may make it hard to keep him off the field for long.